“Use no spray before its time” is the advice offered by the UC Davis California Backyard Orchard website. The Integrated Pest Management (IPM) approach to disease control on peach trees and other fruits has established a calendar of preventative care and use of fungicide treatments. Many systemic fungicides are considered by the EPA to be damaging to the environment and detrimental to health. Peach trees live for 15 to 20 years and are easy to care for. They do not require a pollinator tree nearby but do require well draining soil rich in nitrogen. Fertilization with mature compost provides adequate nitrogen and the other essential soil nutrients. Peach trees need deep summer watering, pruning each year, and vigilance in pest and disease management. Peach leaf curl is caused by the Taphrina deformans fungus, which produces reddish areas on developing leaves in the spring. These areas become thickened and puckered, causing the leaf to distort and curl. The leaf becomes yellow and grayish white, producing velvety fungal spores. The fungus also causes new twig shoots to thicken and distort. Fruit production is limited and if left untreated, the tree may die. Integrated Pest Management uses natural predators to help control harmful insect and disease infestations. It is a component of the organic gardening or sustainable agriculture approach to garden and farm management. IPM uses fungicides and other chemical controls only when necessary and in amounts that minimize the negative effects on beneficial insects in the garden. Copper fungicide spray is a part of IPM recommendations to control peach leaf fungus. “The most commonly used, safest, and effective fungicides available to home owners are fixed copper products,” according to the California Integrated Pest Management Program website. Copper sprays are available in various strengths, listed as Metal Copper Equivalent (MCE) on the label. A product with fixed copper mixed with oil is recommended for home gardeners. Repeated annual use of copper spray may result in copper build-up in the soil and harm to living organisms. Mature compost added to soil has been found to transmute excess metal before it migrates to waterways. Copper fungicide is sprayed on dormant peach trees in November and February to control peach leaf curl. Copper is also recommended for the shot hole fungus. 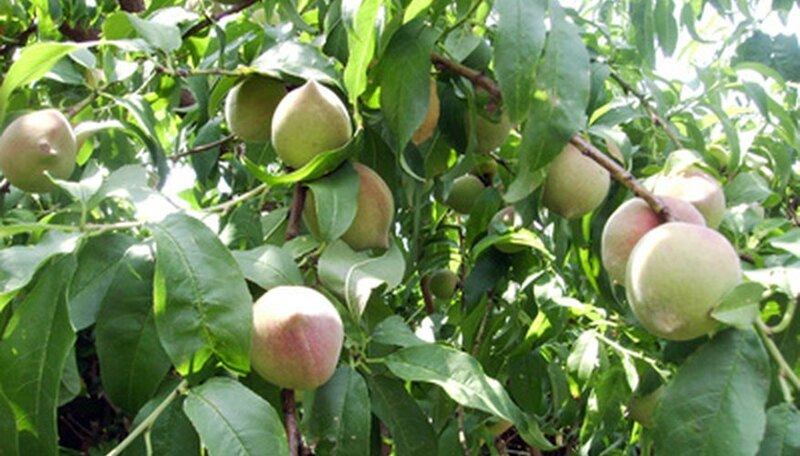 Peach trees are fertilized with mature compost after harvest. Young trees are fed monthly. Compost contains the essential nutrients for healthy growth, which helps the tree resist disease. Cultivars resistant to leaf curl fungal disease include Indian Free, Q 1-8 and Muir.